Join us at the zoo for a dynamic and fun education program that is focused on animals, conservation, and stewardship. We offer a variety of programs that satisfy many science benchmarks while also being engaging and informative. 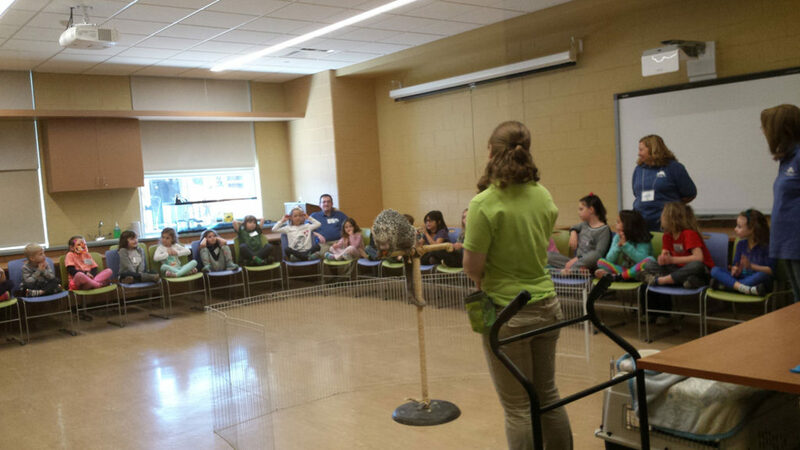 Many programs can be adapted to a variety of ages and abilities; most programs are ~45 minutes long and do not include zoo admission unless purchased separately. Most of our programs are also available for outreach; additional fees apply. Please see individual program descriptions for details. Program fees: most classroom programs are $125 per group and limited to 35 people (children and adults total). The program fee is ONLY for onsite education programs, additional fees apply for zoo admission or for outreach programs. Please call guest relations at 973-731-5800 x221 for group pricing information. For additional program information, please contact Marguerite Hunt at mhunt@parks.essexcountynj.org or 973-731-5800 x103. Programs are suggested by age, however please feel free to discuss with us your group’s needs and how our program content may fit into your curriculum. Description: Just like our programs for younger folks, these programs encourage critical thinking about and meaningful connections to the biology, ecology, and evolution of animals by using guided inquiry, animal ambassadors, and appropriate biofacts to illustrate key scientific concepts and themes. However, the content and language used in these programs is more advanced and is therefore better suited to a more mature audience; please contact us for more information if you’re interested in one of these programs. Most programs are 30-45 minutes long . Please see individual program descriptions for details. Description: Caring for our animal ambassadors goes deeper than just feeding and cleaning! Participants in this program will engage in a discussion about the history of zoos and TBZ; the evolution of our conservation, education, and research mission; and what we do to protect and serve wildlife locally and globally. Description: Using birds as a model organism, students will illustrate and describe the structures, functions, and organization of animals. Includes an extensive display of related biofacts plus an opportunity to meet ambassador animals and discuss how both their internal and external anatomies have evolved to aid in survival. Biofacts will be incorporated into the lesson to illustrate the internal design of our animal subjects. Description: Students will examine the connections between biology, the environment, and adaptive situations that inform the process of evolution in various species. The lesson includes a brief overview of cell division and genetics, followed by discussion of various genetic expressions. Students will learn about the benefit or detriment certain adaptations pose to individual animals, and the effects on their survival in the wild. This program is about 90 minutes. Daily On Grounds Public Programs: Live animal presentations are given daily in season (May-October). Keeper talks and animal feedings are often given throughout the day. Please check the activity board at the zoo for times and locations.